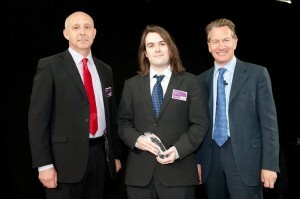 Adam Copp, a Junior honours Computer Science student won the TARGET jobs IT and Computer Science Undergraduate of the Year Award for 2011. The award was sponsored by BT and, through a series of online tests, application forms, interviews and assessment exercises, Adam emerged as winner. BT only targeted a relatively small number of universities and so he beat off competition from other excellent students from other excellent universities. Adam collecting the award from Michael Portillo (who hosted the awards) and Andy Skingley, Director of IP, Media and Mobility Platforms at BT.